Please visit www.FLSRC.org select one of the quick links on the right hand side. All referee courses are currently held online. Follow the prompts to create your referee profile, please ensure you take the Grade 8 Referee Course. All newly trained referees always start in our recreational soccer program, there, they gain their experience and increase their confidence. When the referee assignor thinks you are ready to move onto the next level (competitive soccer), he will then speak to you and assign you games at the competitive level via gotsoccer. Please do not create a referee account at gotsoccer as FYSA will create one for you and send you the temporary userid and password. Click on [Referees and Assignors], Click on [Register] underneath [New Accounts]. If you are over 18, a background check must be performed. If you are under 18, you must perform an age verification. This can be found at the top of your gotsoccer referee account web page. I took the new referee entry course and I have finished my modules and test, what’s next? 3 times during each month between July and December, and twice between January and March, all course completions are exported from the registration system and sent to the United State Soccer Federation Referee Program office where a USSF ID number is assigned. When the registration comes back with the assigned ID number, the information is sent to Florida Youth Soccer Association (FYSA). FYSA is the designated Risk Management (RM background check) authority in the State of Florida. Florida Statutes require any one over the age of 18 is required to perform a Background Check. FYSA will notify by email each new referee of their Risk Management responsibility. Any cost for RM is between FYSA and the individual referee. Referees under the age of 18, only verify their age. FYSA will create a new referee gotsoccer account for you and will email you your temporary log-in information. FLSRC does not assign any games. FLSRC only trains and certifies annually. Referee Dress Code - This document will help you with looking like a pro on the sidelines. Information from US Soccer for the NEW Referee – New Referees have many questions, that’s OK! The attached guide helps you get the answers you are looking for. Always remember that the game is for the players. Player safety and fair play comes first. Dress and Act Professional. Shirt tucked in and socks are picked up. Look like you want to be there! The referee’s decision is final and not subject to debate. This is the most basic rule of any sport. Players, coaches and spectators must accept this principle. Faced with verbal harassment, intimidation, or physical threats, a referee has the right to abandon a game in these circumstances. We cannot afford to drive referees away from the game. Any game official is under enough pressure without that added unnecessarily by players, coaches and spectators. Please visit Florida State Referee's website at http://www.flsrc.org/ select one of the quick links on the right hand side. All Referee courses are currently held online. Follow the prompts to create your referee profile, please ensure you take the Grade 8 Entry Level Course. All certifications are open. Please create a gotsoccer.com referee account, this is different then your players account. If you are over 18, a background check must be performed. If you are under 18, you must perform an age verification. This can be found at the top of your gotsoccer referee account web page. All newly trained referees start in our recreational soccer program, there, they develop experience and build up their confidence. 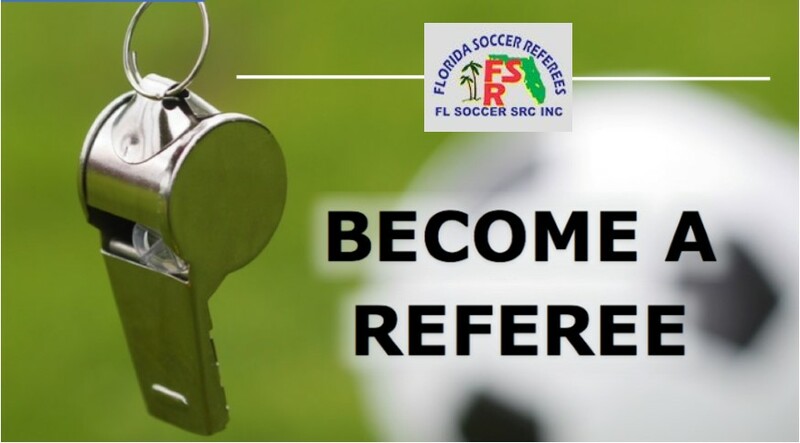 Our Referee Assignor will place you with experienced center referees, they will help you develop your referee skills. When the referee assignor thinks you are ready to move onto the next level, he will then assign you competitive games via gotsoccer. When on the field, please ensure you always dress and look professional at all times... Shirt tucked in, socks pulled up.